I wanted to pass on some goodies from two of my favorite friends. The first is Meagan at Baby Swank. She's doing a series on her blog about revamping your Etsy shop. I know I for sure will be following along! If you sign up for her newsletter she can let you know when new posts in the series will be up. The second is Chrissy at Sew Lux. Chrissy is just awesome period. :) She recently purchased a new social media set from me (this is her second one!) and she sent me some blog love. I wanted to send her some back! 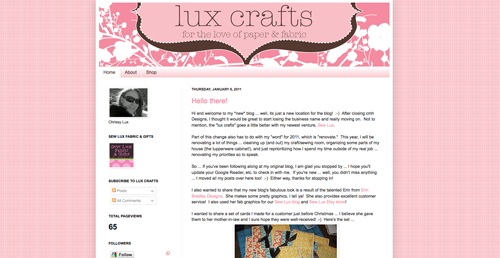 I also wanted to show off how Chrissy customized her blog layout (because the possibilities are endless!). I hope everyone is enjoying their Friday and that you all have a great weekend!